I was given a bag of chunky weight yarn and I already had a pair of wooden purse handles so I thought the combination might work well to make this tweedy bobble purse. 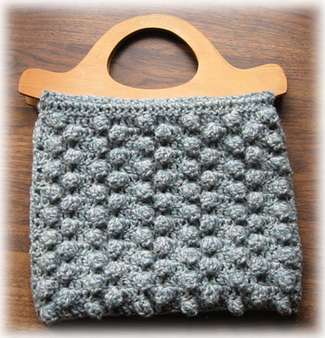 The purse pattern is an old one given as a hand-out by a local wool store, done on a typewriter, with an awful hand-drawn sketch of the bag. The store closed forty years ago, so I had no idea what the purse would actually look like until I made it. I’m going to use this bag to take small crochet projects out with me (it’s amazing how much crocheting you can get done while waiting for appointments). 6.00 mm crochet hook for double weight yarn (this is the size that I used with my chunky yarn); 5.50 for worsted weight; 4.50 for sports weight. Directions: – Chain 37 sts. Row 1:- Dc in 4th ch from hook, and in each ch across. Row 2:- Ch 3, dc in each dc across. Repeat row 2 twice. (These 4 rows turn over the handle). Row 3:- Ch 3, dc in second dc, *5 dc in next dc, remove hook and drop st, insert hook from front to back in first of 5 dc, draw dropped st through loop on hook, – bobble made, 1 dc in next 5 dc. Repeat from * and end with 1 dc in last 2 dc. Row 4:- Ch 3, 1 dc in next dc, 1 dc in st of bobble, 1 dc in next 2 dc, *Make bobble in next st inserting hook from back to front of first dc, 1 dc in next 2 dc, 1 dc in st of bobble, 1 dc in next 2 dc. Repeat from * to the end of the row. Row 5:- Ch. 3, 1 dc in next st, *Make bobble as in row 3, 1 dc in next 2 dc, 2 dc in st of bobble, 1 dc in next 2 dc. Repeat from * to the end of the row. Repeat rows 4 and 5 eight times for double, ten times for worsted, twelve times for sport yarn, or stop when piece is as long as you want it, or until you have used half the yarn. 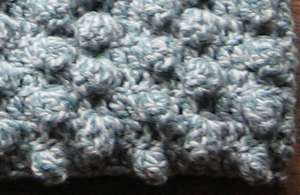 Sew or single crochet the pieces together, leaving 3 inches at the top of each side for purse opening. Turn edges over handle and sew on the inside.